Like us, our pets can be prone to dental issues including gum disease and tooth decay. Taking the time to care for our dog’s and cat’s teeth is a very important part of maintaining their overall wellbeing. Today to mark the beginning of Pet Dental Health Month, we are taking a look at five steps to improve your best friend’s dental health. Go and take a good sniff. Cat and dog breath isn’t meant to smell like roses, but your pet’s breath shouldn’t be offensive either. If your pet’s breath has a strong or unusual odour, then you may need to take them to the vet for a check-up. With your pet facing you, gently push back his or her lips and take a look at their mouth. The gums should be firm and pink, not white or red, and shouldn’t show any signs of swelling. Your pet’s teeth shouldn’t be loose or broken and should be clean and free of any brownish tartar. Excessive pawing at mouth area. Bacteria and plaque forming foods can cause build up on your pet’s teeth. This can harden into tartar, potentially causing gingivitis, receding gums and tooth loss. How can you prevent this happening to your pet? Like us, regular brushing will help minimise your pet’s chances of having tooth decay. You can create your own tooth-brushing kit for your pet. 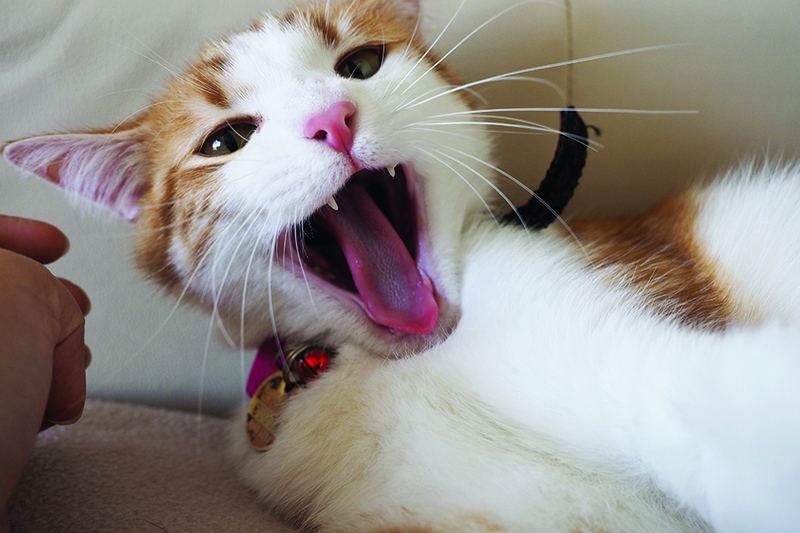 For cats, cotton swabs and a small toothbrush are the best items to use on your cat’s teeth. With dogs you can use a canine specific toothbrush or some soft gauze wrapped around your finger to brush their teeth. Toothpaste designed for humans can be unhealthy for your pet so look for pet specific toothpaste available from most pet stores. If you are unsure of what to use, talk to your vet. August is Pet Dental Health Month. An initiative of the Australian Veterinary Dental Society (AVDS), pet Dental Health Month is the annual celebration of healthy smiles and the well-being of our pets. From 1 to 31 August, The Lost Dogs’ Home Frank Samways Veterinary Clinic will be offering free dental health checks for cats and dogs. Limited places are available, so bookings are essential. All pet owners booking a free dental health check in August will receive a free dental goodie bag for their dog or cat, while stocks last. If you are interested in taking up the free dental check offer, bookings can be made by calling the Frank Samways Veterinary Clinic on (03) 9329 2755 or by visiting the clinic in person at 1 Boundary Road, North Melbourne.